In today's Hit and Run, Jay Jaffe looks at the impact of the latest injuries of Hunter Pence and Yasiel Puig on the Giants and Dodgers. On Tuesday, the Giants gained a game on the Dodgers in the National League West race, but they suffered an even bigger loss, placing Hunter Pence on the disabled list due to a moderate strain of his left oblique. The 32-year-old rightfielder's third DL trip of the season gives the banged-up defending champions yet another obstacle to overcome, as he will miss a crucial stretch of games against other NL postseason contenders. Pence suffered the injury while making the final out of Monday night's 2–1 loss to the Cardinals. Via an MRI taken on Tuesday, the expectation is that he won't miss more than the minimum amount of time, but that means that he won't be eligible to return until Sept. 2 at the earliest. That puts him on the shelf for the final game of the team's series against the Cardinals in St. Louis, a four-game series in Pittsburgh, a pair of three-game series at home against the Cubs and Cardinals, and then the first two games of a three-game series against the Dodgers in Los Angeles. The Giants, who at 65–54 are two games behind Los Angeles in the division race and three games behind Chicago for the second wild-card spot, are 1–7 thus far this year against those NL Central squads, though they own a 9–3 advantage against their top NL West rivals. Pence came into this season with an impressive track record of durability. Since debuting in the majors with the Astros on April 28, 2007, he had served just one DL stint, a 29-game absence due to a right wrist fracture during his rookie season. Since the start of the '08 season, he had played more games (1,110) than all but Robinson Cano (1,117) and Adrian Gonzalez (1,116)—an average of 158.6 per year—and had played 383 consecutive games since being traded from the Phillies to the Giants on July 31, 2012. Alas, an errant pitch from Cubs prospect Corey Black broke his left ulna on March 6, and he missed the Giants' first 36 games before making his season debut on May 16. He played in just 18 games before tendinitis in his left wrist sidelined him in early June, missing another 30 games before returning on July 7. Overall, Pence has played just 52 of the Giants' 119 games, hitting .275/.327/.478 with nine homers and a 125 OPS+. The team is 34–18 in those games, compared to 31–36 in the ones he's missed. Unfortunately for the Giants, he's not the only outfielder currently sidelined. Angel Pagan went on the DL on Aug. 11 due to patellar tendinitis in his right knee, a chronic problem dating back to last season that has caused his performance batting lefthanded—normally his stronger side—to plummet to .239/.271/.298 in 303 PA. Nori Aoki, who himself missed four weeks in June and July due to a fracture in his right fibula, is on the seven-day concussion DL in the aftermath of an Aug. 9 beaning. Those absences have pressed into service the two outfielders who have played rightfield the most in place of Pence: Justin Maxwell (45 starts) and Gregor Blanco (19 starts). Aoki is due to rejoin the team on Thursday; both he (.302/.368/.387 for a 115 OPS+) and Blanco (.296/.376/.419 for a 126 OPS+) have been productive, but Maxwell (.214/.282/.353 for a 79 OPS+) has been overexposed. Juan Perez, recalled when Pagan went down, is a career .212/.261/.306 hitter, so any way you slice it, the team can't expect much more than replacement-level production from one outfield spot. With the lefty-swinging Blanco and Aoki playing regularly, San Francisco is also somewhat vulnerable to southpaws, though both have matched or outdone their career splits in that context this season. If the outfield mess were the Giants' only injury problem, that would be one matter, but Joe Panik is out until early September due to lower back inflammation, and the rotation is down Tim Hudson, Tim Lincecum and deadline acquisition Mike Leake, all of which has left manager Bruce Bochy scrambling to find able bodies. San Francisco has won six out of its last eight games to climb to 9–8 for the month, but via the Baseball Prospectus Playoff Odds, the team's postseason chances have fallen from 57.4% to 37.4% in that span, with a four-game sweep at the hands of the Cubs last weekend knocking the Giants out of a playoff position. Meanwhile, one potential solution to the team's injury woes appears to have fallen by the wayside. In the wake of Panik's injury, the Giants showed interest in Chase Utley, who lives in nearby Sausalito, but the 36-year-old second baseman holds 10-and-5 rights that allow him to block any potential trade, and he reportedly requires some level of assurance of regular playing time if he's dealt, something he hasn't received from any team. On Tuesday, Phillies team president Pat Gillick and general manager Ruben Amaro Jr. both said in radio appearances that they expect Utley to stay with the team for the remainder of the season. Even so, on Wednesday afternoon, Fox Sports’ Ken Rosenthal reported that a deal involving Utley was possible today, though the latest rumor has him heading to the Dodgers. If the Giants were to acquire him, Utley could play either second base or first, with Brandon Belt shifting to leftfield and Buster Posey covering first base while Hector Sanchez or Andrew Susac (who just returned from the DL himself) catches. With three players out of position, that's not exactly optimal, and the point is probably moot anyway, though GM Bobby Evans still has another 12 days before the waiver deadline to augment the roster in the midst of so many injuries. The Giants weren't the only team to lose their star rightfielder on Tuesday, as Yasiel Puig left the Dodgers' game against the Athletics in the eighth inning after legging out an infield single that helped spark a three-run rally via A.J. Ellis' home run. He was replaced by Carl Crawford, and the Dodgers said after the game that Puig was dealing with tightness in his right hamstring. The removal appeared to be more of a precautionary measure than a full-blown catastrophe, as Puig remained in the dugout after being removed, instead of retreating to the clubhouse for further treatment. An MRI on Wednesday revealed “a very mild strain,” so he’s considered day-to-day. 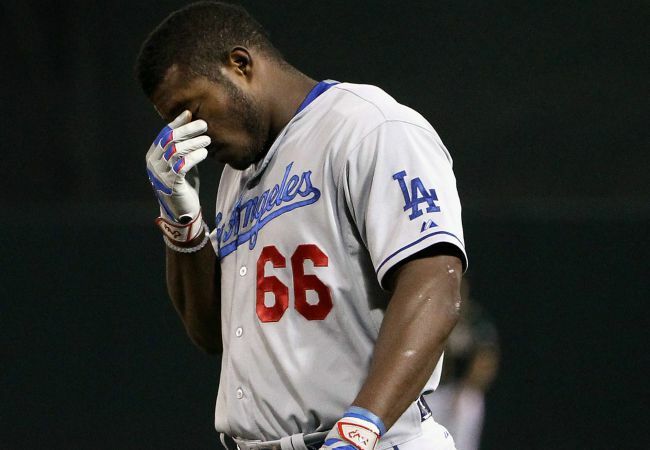 This is just the latest turn in a trying season for the 24-year-old Puig, who missed 39 games from late April into early June due to a strain in his left hamstring. That injury has affected both his speed and his power, as he's struggled to use his his lower half in his swing and has hit just .250/.320/.434 with 10 homers and two stolen bases; his 109 OPS+ is down from a sizzling 150 in 2013–14. Notably, he's been putting in extra work with hitting coach Mark McGwire to counteract the bad habits he's developed in the midst of his injuries, and during one stretch of 18 starts, he bopped six home runs, but his plate discipline has regressed, and his play has been conspicuously joyless. Alongside his injuries, he's cut back on his signiture bat flips amid criticism that they show disrespect, and has been stung by reports of friction with teammates, some of which came via Molly Knight's recent book, The Best Team Money Can Buy. Two of his most visible allies from last season, Hyun-jin Ryu and Juan Uribe, are no longer with the team, the former due to season-ending shoulder surgery, the latter via trade. While the Dodgers rank fifth in the league in scoring overall at 4.20 runs per game, they've scored more than five runs in just three of their last 17 games. Joc Pederson is in an extended slump, Howie Kendrick is on the disabled list and their bullpen is in a state of perpetual collapse. Off the field, this week’s dismissal of vice president of international scouting Bob Engle and the core of their international scouting staff and the hiring of ex-Brewers manager Ron Roenicke as their third base coach, bumping Lorenzo Bundy to the bench and assistant hitting coach John Valentin out of uniform, has left no shortage of palace intrigue. Prior to Tuesday's bullpen meltdown against the A's—Los Angeles squandered Ellis's big blast and lost in 10 innings—the Dodgers had won five out of six, but that was on the heels of a four-game losing streak. They simply haven't been able to shake the Giants, and have little margin for error despite a payroll that’s pushing $300 million. Though they've won six out of their last eight games against fellow NL doormats Cincinnati, Colorado and Atlanta, the Padres (58–62) are going nowhere yet again despite their revamped roster and a midseason managerial shakeup. On Tuesday, GM A.J. 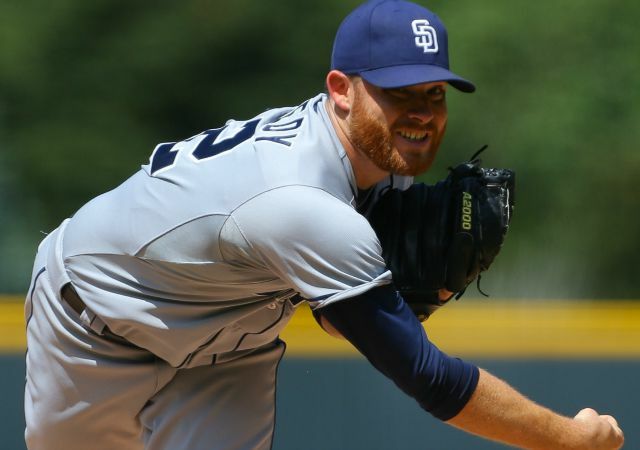 Preller made his first significant trade since the April acquisitions of Craig Kimbrel and Melvin Upton Jr., dealing Will Venable to the Rangers in exchange for minor-league catcher Marcus Greene and a player to be named later. Yet on the same day, Preller reportedly pulled back both Ian Kennedy and Joaquin Benoit from waivers after they were claimed, meaning that they can't be dealt for the remainder of the season. The 32-year-old Venable, who is making just $4.25 million this year, entered the season as the fourth outfelder behind the newly-acquired trio of Justin Upton, Wil Myers and Matt Kemp. It seemed only a matter of time before he was dealt, but amid Myers's injuries and defensive woes, he has instead made a team-high 56 starts in center with another 10 at the two corners, batting .258/.318/.378 with six homers and 11 steals for a 98 OPS+—far off the pace of his breakout 2013 (22 homers and a 126 OPS+) but still better than last year's slump (eight homers and a 79 OPS+). His defense has been nothing to write home about (-4 DRS in center, -6 overall), so he's been worth just 0.4 WAR, less than what Myers has accumulated (0.6) in about half of the playing time despite his own struggles in centerfield (-8 DRS). Venable's versatility makes him a solid, inexpensive addition to the Rangers, while his departure brings back in Greene a 20-year-old catcher who is currently rehabbing from June Tommy John surgery on his right elbow; there will also be a player from a list of prospects "closer to the majors," one who is expected to be the larger piece of the deal. Taken in the 16th round of the 2013 draft out of New Mexico Junior College, Greene has hit .250/.390/.397 with 11 homers and 12 steals in 577 PA across parts of three seasons; he played in just 25 games for Class A Hickory this year before going under the knife, batting .218/.365/.500 with five homers. Venable's departure also clears a space for breakout prospect Travis Jankowski, a 24-year-old who was a supplemental first-round pick out of Stony Brook University in 2012. Blessed with plus-plus speed but completely lacking in power, Jankowski is a true centerfielder and leadoff hitter in the making. After finishing last season at Double A San Antonio, he returned there to start this season and earned All-Star honors before being promoted to Triple A El Paso. Between the two stops, he's hit .335/.413/.425 with one homer and 32 steals in 434 PA.
That deal makes sense. More of a head scratcher is Preller's decision not to part with either Kennedy or Benoit, who according to CBS Sports' Jon Heyman were claimed on waivers by an unidentified team and then pulled back after a deal couldn't be reached. For Benoit, the situation makes at least some sense, as the Padres hold an $8 million option for 2016, the same salary he's making this season. The 37-year-old righty has rebounded from the shoulder woes that limited him to three appearances after Aug. 26 of last season, posting a 2.13 ERA and 8.2 strikeouts per nine in 50 2/3 innings. As for the 30-year-old Kennedy, who's owed $2.58 million of his remaining $9.85 million, he’s far removed from his 21-win, 2.88 ERA season with the Diamondbacks in 2011. In 122 innings, he's posted a 4.20 ERA (85 ERA+) and 5.08 FIP thanks to a gaudy 1.9 homers per nine despite pitching half his games in spacious Petco Park. Kennedy has failed to maintain a league-average ERA in any of the last three seasons after posting a modest 101 in '12. Over that four-year span, he's delivered a 4.17 ERA, 4.13 FIP, 89 ERA+ and 1.2 homers per nine in an average of 178 innings per year—good for a total of 1.9 WAR. He's 0.4 wins below replacement this year despite posting a 2.63 ERA in six second-half starts. That's not a pitcher over whom you haggle with another team for a second-tier prospect; that's one whose remaining salary you dump on a claiming team and count the money. Kennedy, who will be a free agent this winter, isn't good enough to merit a qualifying offer (likely above $16 million for one year) that would net a compensatory draft pick if he signs elsewhere. Compare the above performance to that of Ervin Santana, who signed a four-year, $55 million deal with the Twins in December after receiving a qualifying offer from the Braves. In his previous four seasons, he had delivered a 3.87 ERA, 4.19 FIP, 99 ERA+ and 5.7 WAR—three times the value—because his work came in more difficult ballparks. From here, Kennedy appears more likely to draw the inflation-adjusted equivalent of the three-year, $24 million one of former Yankees teammate Phil Hughes, who hit free agency on the heels of his second ERA above 5.00 in thee years.